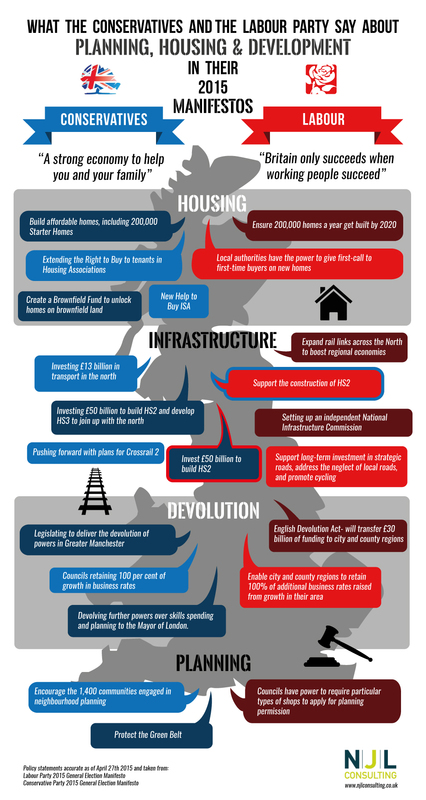 With the 2015 General Election looming, we've put together a handy infographic detailing some of the main manifesto pledges regarding planning, housing and infrastructure, made by the Conservatives and the Labour Party. If you've got any questions about how any party's election pledges might affect your plans for commercial or residential development, leave us a comment below or get in touch via Twitter - we always want to hear your thoughts. Please include attribution to http://www.njlconsulting.co.uk/ with this graphic. We're an expert team of planning consultants based in Manchester and Leeds, and operating across the whole of the UK. We're committed to taking the complexity out of the planning process, enabling you to focus on the success of your development. GMSF 2019: The right direction for Manchester?